4.0 out of 5 based on 74 bloggers and 13 commenters. 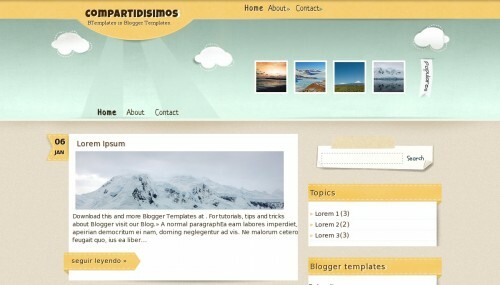 Compartidisimos is a free blogger template with 2 columns, right sidebar, web 2.0 design, fresh look, an exclusive design for Blogger, footer columns, social bookmarking icons, posts thumbnails and vectorial elements. Excellent template for blogs about art, family, fantasy, home and decoration or nature. How can I change this Facebook and Google+ thing on the left in English? this templet not working at all to me getting error “server setting failed” amyone know how to troubleshoot it? when i was installing it i got error anyone can tell me that is it not working for them too? Really nice templates. Only one question.How can I change the word “populares” to english? I having problems with tha pages. I can’t move them to their place as it on the template. It is keep going back to the side. Anyone know’s how to solve these problems? You can contact with the autor and discover something about this template here: http://www.compartidisimo.com/2011/08/mi-plantilla-para-ustedes.html (in spanish). You can comment and, maybe, you’ll have a reply. what a nice template .i have many thanks to you .